I ran a simple experiment in 2005 to visually demonstrate how effective ozone can be in killing microscopic organisms. I took the end slices from a two week old loaf of rye bread (baked without preservatives) which had begun to show signs of bread mold. I placed one of the end slices from that loaf in a zip lock bag and placed the output tubing and air stone from my 215 mg, air fed cold plasma ozone machine inside the bag and ran the ozone generator for 20 minutes. I then sealed the bag and placed it in the refrigerator for one week. For a control, I took another end slice from the same loaf and sealed it inside a second plastic zip lock bag -without ozonating it. I placed both bags in the refrigerator side by side and just left them there for one week. The photos below show what the bread looked like after I took it out of the bags one week later. 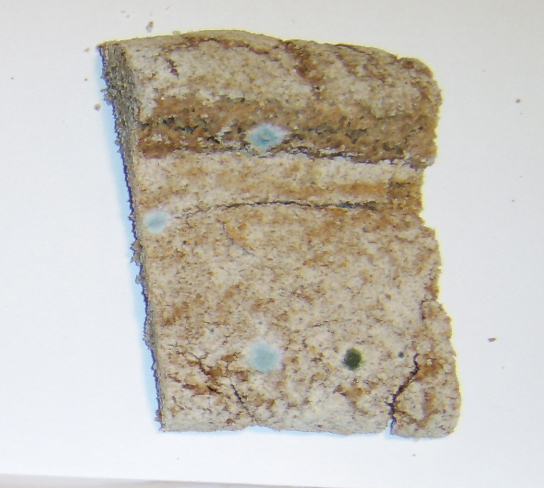 The mold which had begun to grow on the slice of bread which was ozonated had turned white and showed no further signs of growth. 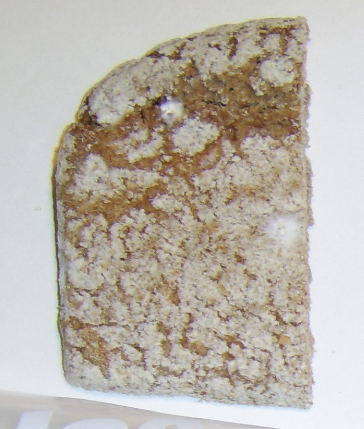 The slice of bread which was not ozonated continued to grow mold (although at a slower rate due to refrigeration) which is apparent by its green color. You could perform this same experiment with petri dishes and growth medium which was smeared with bacteria or virus particles and you would see the same results. The control dish without ozonation would demonstrate growth, while a petri dish which was exposed to ozone, covered, and placed side by side with the control dish would show no growth. 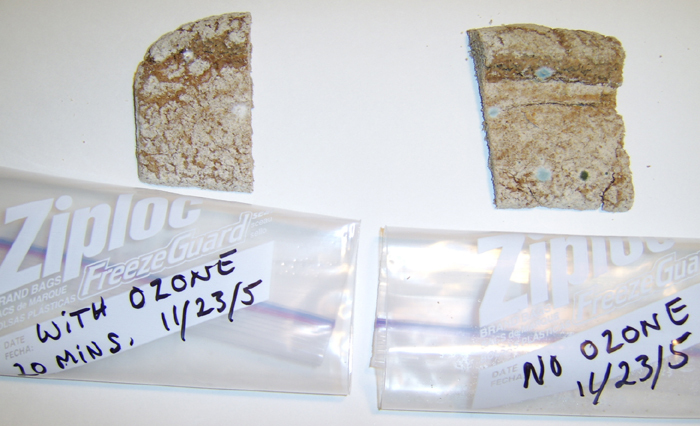 Ozone is simply an amazing germ killer and the pharmaceutical industry, along with their well placed minions in government, do not want you to know that. .
End slice from the same loaf of rye exposed to ozone for 20 minutes and refrigerated for one week, shows no sign of further mold growth. Dead mold organisms have turned white, while live mold would appear green, as seen above.